We know the turkey is da Queen of the show on Thanksgiving day, but that doesn't mean the table setting and decor can't give that Queen a run for her money. Here are a few show-stopping settings we found to get ya motivated to turn it up a notch this year. The first is a gravity defying centerpiece by the uber fabulous Preston Bailey. How in the world is that thing standing? Any who, feast on - yes, the pun is intended. Any faves? 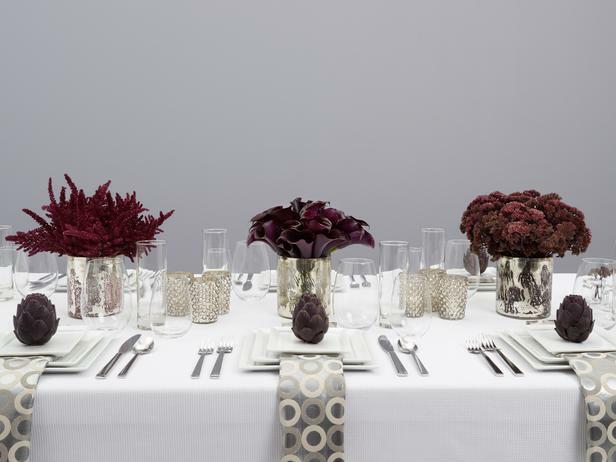 We love that the the oxblood trend will likely seep into many settings this year. But I think my faves are the simplicity of setting at that stunning glass table with the Lucite chairs, and the personalized touches added to the candles and napkins in the that rustic setting. Which do you prefer? 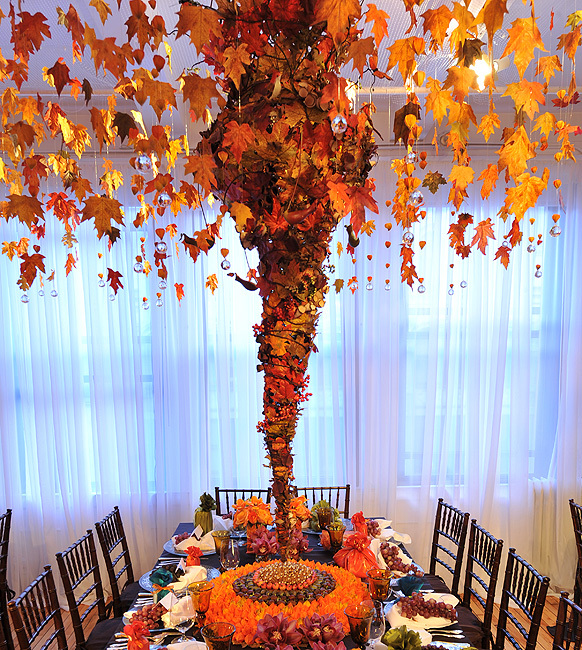 Do you go all out with your Thanksgiving decor or do you just sit back and let that turkey do her thing? Holla. Thanks for all the anniversary wishes. The hubs pulled out all the stops and it was a great night. Did anyone (besides moi and Linda at My Crafty Home Life) watch the premier of Million Dollar Decorators? I caught a bit and am so NOT impressed with the ridiculous expenditures. A $50,000 table that weighs a ton? So unnecessary. And what decorator worth his or her salt would NOT know that the paint crew and company had not yet finished doing their job or mailed a $10,000 check to a vendor you'd NEVER met or seen his/her workspace? Come on..............This is reality TV that is not based in reality, at least clearly not my reality which aint million dollar budgets. that first centerpiece is BRILLIANT! haha i love it! there's just two of us so we keep it really simple for the holidays. if i had a big family, i wouldn't mind that. They are fabulous! I like 2 3 4 the best. I have given up on HGTV! i forgot the show started. the egos turned me off honestly from the first season but I'll dvr it. it won't be a show I rush to watch the night it airs. I'll catch it whenever. I love the lucite with gold branches. Fabulous.